Rami Malek is saying "Don't Stop Me Now" to the rest of awards season. It was an extremely stacked lineup in the category for Best Actor in a Motion Picture-Drama at the 2019 Golden Globe Awards, but only one person emerged victorious. Malek went home with the award and beat out a tight race with other very talented competitors. The nominees were Bradley Cooper in A Star Is Born, Willem Dafoe in At Eternity's Gate, Lucas Hedges in Boy Erased, Malek in Bohemian Rhapsody and John David Washington in BlaKkKlansmen. In his acceptance speech, the actor praised the band Queen and especially Freddie Mercury, whom he portrayed in the film. "I am beyond moved right now," Malek began his speech. "My heart is pounding out of my chest right now." He then thanked Queen's guitarist Brian May and drummer Roger Taylor "for ensuring that authenticity and inclusivity exists in music and in the world and all of us." May sat next to the winner at their table throughout the evening. Malek paid a ton of homage to the "Bohemian Rhapsody" singer who died in 1991 at the age of 45 due to complications from AIDS. "Thank you to Freddie Mercury for giving me the joy of a lifetime," he continued. "I love you, you beautiful man. This is for and because of you, gorgeous." Malek toldRyan Seacrest on the red carpet before the show tonight that he believes he was cast because of the "mischief I have going on in my eyes." 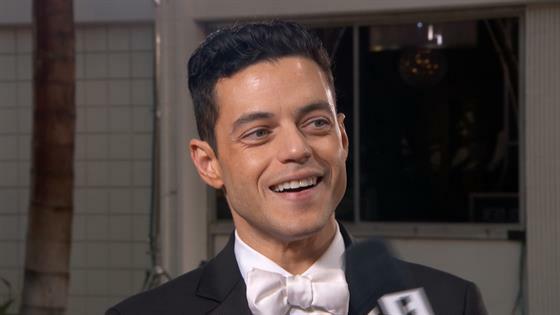 Bohemian Rhapsody co-star Joseph Mazello told E! News in September that Malek's transformation into Mercury was jaw-dropping. "I got goose bumps because he just embodied him so perfectly. It was a crazy thing to know someone so well and just be who are you?" he said. The Mr. Robot actor also told us at the time that he believes Mercury—who was born Farrokh Bulsara—would have been proud of the film if he saw it today. "I think he would genuinely just hope that people enjoyed it, that they loved the music, that he felt like we captured these characters and his essence well enough and close enough," he said. Moments after Malek accepted his award, the rest of the cast joined onstage as they accepted the Golden Globe for Best Motion Picture-Drama. Hedges and Washington both garnered their first-ever nomination for their respective films. Congratulations again, Rami and to the rest of the nominees and winners! Make sure to check out the full list of winners here.